You know about the Food and Drug Administration, right? It’s the federal government agency responsible for protecting and promoting public health through the supervision of food safety (among other things). The FDA rules don’t only apply to humans, the agency regulates dog food, too. That’s good to know. But what does a dog food nutrition label mean? 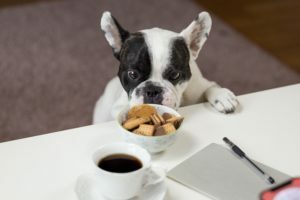 You probably have an understanding of what calories, carbs, sodium, sugar, and an ingredients list indicate for a human diet, but that data doesn’t apply to pups. Animal feed is not the wild, wild west. There are federal rules and regulations to ensure food safety. The FDA set standards for all animal feed including proper identification of the product, manufacturer’s name and address, and a listing of ingredients. Some states also have additional labeling regulations. Many states require animal food manufacturers to follow the AAFCO (Association of American Feed Control) guidelines. This organization established standards for nutritional and balanced animal foods. If you see a label that says the food is “completed and balanced,” that means the food contains the minimum amount of nutrients necessary for dogs. 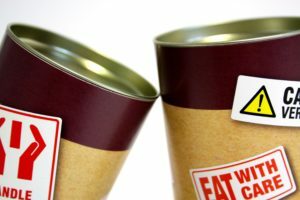 How do you read a dog food label? If you review the label on your dog’s food, you’re not alone. A Pet Food Packaging Survey from label maker Luminer found a staggering 92% of people with dogs read the ingredients list when buying new animal food. Now for the actual label. One of the first things you’ll see on the food label is an ingredient list. Just like on human food labels, the ingredients on animal food must be listed by weight. If your dog is eating a meat-based food, the meat will likely be listed first. However, keep in mind the meat is about 75% water, according to the FDA. Protein is important to a dog’s diet. Make sure protein is one of the first listed ingredients. Take a look at the “flavoring” ingredients. If the food has high-quality protein, it should not need [insert protein name here] flavoring to make the food more desirable to your dog. In fact, sometimes flavoring can be used to mask a grain-heavy formula. This is another reason to purchase food with protein high in the ingredients list. Another important piece of data is the guaranteed analysis. This required language lists the product’s nutrient content. It identifies the labeled percentages of crude protein, fat, fiber, and moisture in the dog food. Read the daily feeding recommendations. Forty percent of Luminer’s survey respondents said they don’t follow the package’s directions. Adhere to these guidelines, they are there to ensure you aren’t over or under feeding your pup. 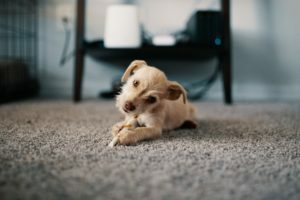 Should my dog eat organic food? Natural, organic, human grade, holistic… All of these characterizations are confusing. Here’s a quick guide to what they mean and the impact on your pup’s food. Natural. This word seems innocuous, but it’s got some power behind it. If a food label says it is “natural” none of the ingredients have had chemical alternations, according to FDA guidelines. Organic. Food labeled organic must adhere to the same standards as organic human food. This type of food, according to the USDA, is grown with fewer pesticides than non-organic food. Holistic. Watch out for the “holistic” label because it has no meaning. The FDA does not regulate the use of this word. There are no legal requirements. Consider holistic a marketing term. Human Grade. This is another term that has no legal meaning. When a product is designated as animal food, it is no longer for human consumption. Lesson: don’t eat dog food. 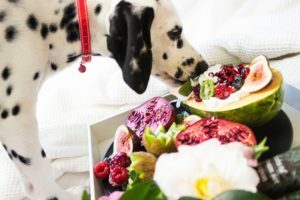 What food is best for your dog? Dogs are carnivores, but they need more than just meat to live a healthy life. According to VCA Animal Hospitals, there are six basic nutrients your pup needs: water, proteins, fats, carbohydrates, minerals, and vitamins. Every dog’s dietary requirements are different, so the best approach to picking food is to always check with your vet. However, VCA does offer some guidelines. Select items with real, recognizable, whole-food ingredients. If you don’t know the majority of listed ingredients, this food isn’t right for your pup. Avoid corn and wheat gluten. Look for food that doesn’t have chemical ingredients like Butylated Hydroxyanisole (BHA), Butylated Hydroxytoluene (BHT), and Ethoxyquin. Try to stay away from food dyes like Blue 2, Red 40, and Yellow 5 and 6. Consider your dog’s life stage. Dr. Jennifer Coates writes in PetMD that puppy food is quite different than adult dog food. Puppies need higher levels of protein, fat, calcium, phosphorous, sodium, and chloride to support their growth and development. 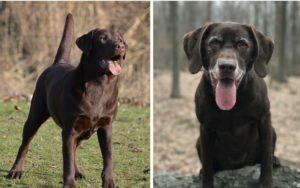 Senior dog food may contain less fat to reduce chances for obesity. It may also have higher levels of anti-oxidants or moderate levels of protein aimed at maintaining muscle mass while not straining the kidneys. What about differences in size? There’s no simple way to determine the exact right amount of food for your pup. One good guideline is the food’s directions. You can also reference this body condition scale to measure how your dog is responding to the amount of food she is getting. Take a look at the label before you buy food for your pup. No matter if it’s treats or kibble, you should pause to learn what you’re feeding your dog. Remember some of the terms are marketing gimmicks and don’t have real consequences in food quality. If you’re looking for snacks you can trust, we’ve got you covered. Check out our healthy treats that make your pup happy and feed a dog in need.